This review should probably come with a spoiler alert. Nora is not the sort of cafe you'd fly into for a routine smashed avo. Instead, you'll encounter sight gags and some cheeky prods at cafe culture; to describe the place and its dishes (there are only six) feels like blabbing the punchline. If you like surprises, and mentally sparring with your meticulously handmade cafe food, then, perhaps stop reading and plan a visit. If (like me) reading "perhaps don't read this" only serves to accelerate your reading, let's just say, I warned you. 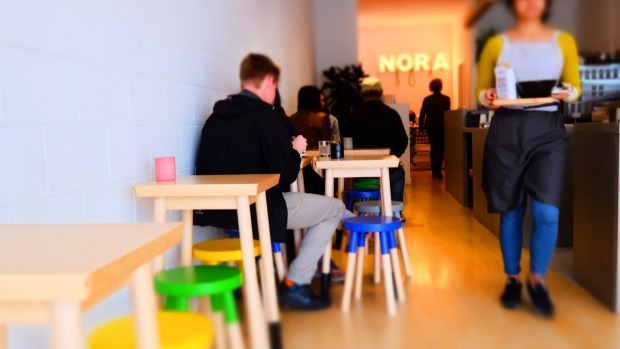 Nora is a smart, small cafe that totally belongs in Carlton: that erstwhile seat of learning, Melbourne Uni, is at the end of the street, and, if a postcode had a dress code, you might call Carlton's smart – flush as it is with designer stores. Nora's look is bright white sparse, with deliberate, clean lines subverted by details of colour or texture. It's clever, too, in that everything has meaning, more than function. Co-owner Sarin Rojanametin has a fine art and advertising background. The self-taught chef (who owns Nora with his partner, Jean Thamthanankorn) traded the alphabet and illustrations, for ingredients and objects, to create something tangibly desirable: food. It's a playful, personal vision. Recognisable breakfast dishes are made unrecognisable with the owners' heritage Thai flavours and knack for peppy presentation, often with a wry nudge. The cereal option, Nora Flakes, is a delicious blend of 15 ingredients: grains (wild rice, quinoa flakes), seeds (caraway), nuts (crystallised hazelnuts and walnuts), fruit (cranberries, durian chips) and coconut. It comes in a specially made cereal box with giant polenta crisps protruding from the top. Eggs? It's a sous vide omelette, with a soft, custardy texture that's nicely countered by its topping of crisp fresh leaves, shaves of radish and chilli dressing. The Flour Water and Salt dish is an individual breakfast tray, with a mini loaf of house-baked sourdough, daikon-flavoured butter, fruit jam (maybe fennel and pear), ricotta, chicken liver parfait and house-cured ham. It fills that place on many menus that's a list of sides to add to toast. It also almost fills the tiny table top, jammed against your neighbour's. The roomiest and best positioned table, in the window, is reserved for produce, displaying the ingredients (with lots of white space between) used in the day's dessert tarts. I envied that lemongrass, coconut, lemon and ginger, but probably not as much as the people waiting for a table. 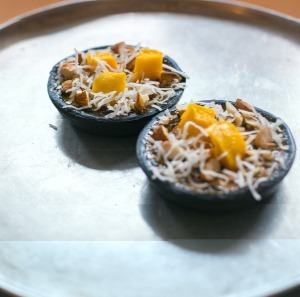 You might know Nora's pretty charcoal black pastry tarts from other cafes they've been supplying. But, here, it arrives a bit smashed, upside-down, and with the pastry pan on top, as though it were dropped. Bloody Nora. Surely coffee is sacred? Uh-uh. Espresso comes in a big ol' mug (a jibe at American-style, bottomless coffee, and so you can stick your nose in and inhale while ingesting). So, you know (some of) Nora's tricks and tastes but there's much more food for thought in the experience.